This Pave Diamond Criss-Cross Aquamarine and Diamond Halo Ring puts a fun and sophisticated twist on a time-honored style. With a refreshing blue semiprecious gemstone, 57 dazzling diamonds and two slender, intersecting bands, this glittering 14K white gold style conveys a sense of contemporary class that makes it a unique and stylish pick. 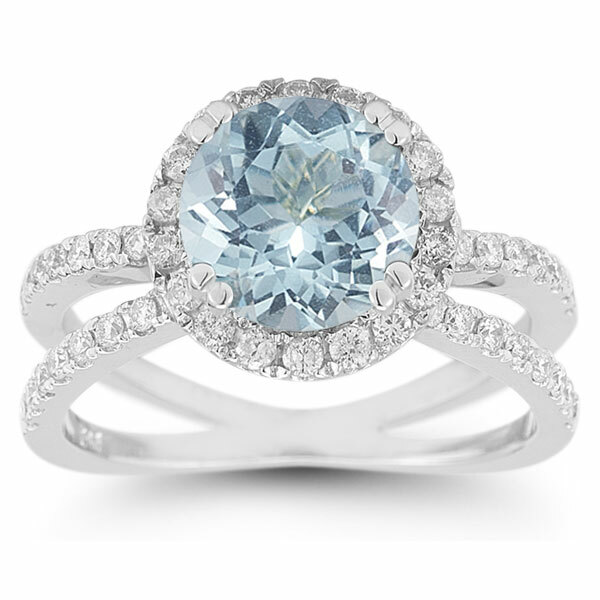 The focal point of this halo ring is an 8mm round aquamarine, a gem with a light, invigorating hue. With a name that means "water" and "sea," this stone calls to mind the clearest Caribbean bay, with a glimmer that resembles the sparkle of the sunlight on the waves. A total of 0.74 carats of diamonds serve as accents to this fresh blue gem, providing gentle contrast and further calling to mind rays of light dancing on the water. Some of these colorless round gems form a glittering frame around this center stone, while the rest stud the two slender 14K white gold bands. While the sparkling stones of the unique ring give it time-honored beauty, it's the one-of-a-kind silhouette of this piece that makes its truly eye-catching. The dual shining bands of this piece cross underneath the center stone and again in the back of the ring, making this a ring with a cool twist. 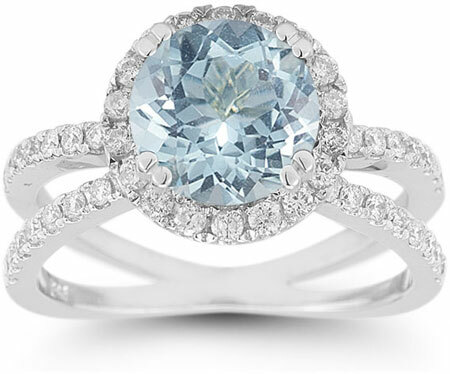 We guarantee our Pave Diamond Criss-Cross Aquamarine and Diamond Halo Ring to be high quality, authentic jewelry, as described above.